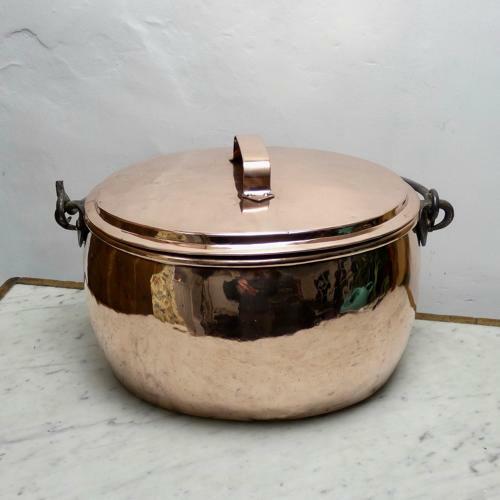 A large, 19th century, copper cooking pot. This piece is English and it dates from c.1820. Although it was made for cooking its' condition is no longer good enough for this but it would make an attractive coal bin. It is made from a heavy gauge of copper and it has castellated seams around the base and up the side. It has seen a lot of use and the copper is now quite pitted and the base is not longer flat.It has a folding steel handle, as it would have hung over the fire, and this is also quite pitted.